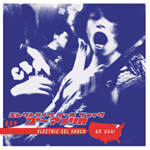 We all know that Japan's Electric Eel Shock ALWAYS deliver the goods live, and with that reputation fully solidified, the time came to make a record that lives up to the hype, and that's exactly what Beat Me does. As a recent issue of Kerrang said: "with assistance from Grammy nominated producer Attie Bauw (Scorpions, Judas Priest, etc.) EES have made an album that harnesses their energy and captures the very essence of their raw onstage power. Beat Me occupies the gaping void somewhere between Queens Of The Stoneage, AC/DC and Black Sabbath. It's both as heavy and serious as that sounds, yet has a mischievous and fun-filled heart beating underneath the guitar wielding heaviness that is wild, unhinged and damn fun to listen too!" We couldn't have said it better ourselves!